Welcome to the Spellbinders™ and Core'dinations® Blog Swap! All this week designers for Spellbinders and Core'dinations will be presenting the unique qualities of our products and showing how they work together for divine die cut designs! For my project I decided to make cupcake toppers and a gift bag to celebrate Fall. With two little girls in Elementary school there seems to be an opportunity, at any given time, to celebrate a special event. These cupcake toppers can be cut at once using Spellbinders Grand Calibur Die Cutting Machine and the Anemone Flower Topper die template. I used Core'dinations Color Core Cardstock in different shades for my sunflowers and the panel for my gift bag. Sanding the cardstock to reveal the core color adds great texture and a weathered vintage look to my project. Spellbinders is offering TWO winners, drawn from the comments left on the participating Designer's blogs, each a $24.99 value die template of their choice. Winners will be chosen randomly at the end of the week. Core'dinations will be giving away prizes too so be sure to visit their Scrapbook Blog for details. Don't forget to stop by each Designer's Blog all week (including the participants from the Blog Swap Day One!) and leave a comment to enter to win! Spellbinders will randomly draw winners at the end of the week from all the comments posted on the designers blogs. This is beautiful! Love the weaving you did on that paper bag. WOWZA! amazing work Kazan! Love them! Your flowers are beautiful and I really love that woven panel. I love that flower! So pretty! I won the anemone flower die as part of a past Spellbinders blog contest, and I love it.It is so versatile and looks different each time a make it with different papers. Love the cupcake topper idea. Wow - those flowers are stunning! Fantastic flowers and that weaving is amazing. Oh my Kazan!! This is gorgeous!! I love the woven design on the bag! Too clever! TFS! AMAZING what u did with that cupcake! How awesome!! Love this Flower Topper. Great ideas. Thanks for sharing. The weaving is great! Love the toppers. Love the Cake toppers - the dies you chose sure give a great result. How cool is this. I love the gift bag and the embelishments you put on it the flowers are great and the weaved paper love it. this paper is great . thanks for sharing and for the chance to win. I love the design for the bag. Your cupcake wrappers are so pretty too. TFS. Yum on the cupcake--and how cute/pretty! All I can say is WOW! The weaving is brilliant! I love the Autumn feel that the colors and sunflowers bring. Just wonderful! What a beautiful idea thanks for sharing. What a cute pair the flowered cupcake and gift bag are! Love the weaving, and the sanding of the surfaces add just that extra touch that makes them perfect! Your woven rectangle on your gift bag and those stunning sunflowers are simply breathtakingly GORGEOUS! LOVE this!!! Love this so much! That weaved panel is amazing! Darling flowers - so fun. Great project. Such an amazing idea..beautiful details. Will put the Grand Calibur on my Christmas wish list. absolutely gorgeous! oh god, I am hungry now! Excellent, wonderful, awesome are just a few ways to describe your projects!! Love the way you've taken an old technique (weaving) and made it look fresh and new! What a beautiful sunflower and bag! Very cute. Love the flowers ! I love the flower! Great work on both projects! Love the paper weaving,and sanding effects. Cute projects! I just love the Anemone flower topper, it has so much dimension! Love your projects. I have the anemone topper and you have given me new inspiration. love the weaving & the color choices. WOW!!! Eye Popping, Jaw dropping breathtaking gorgeous! Oh Kazan! Gorgeous! Please excuse me, I must shop now. I hope I can find the Anemone locally. You are so talented (and I am soooo jealous!) Thanks for sharing so that we can try to recreate your wonderfulness. Hallmark, eat your heart out! They never sell anythin this cute there! Spectacular job! Love your layered flowers and paper weaving. Super creative to do the weaving! Love the colors, too! Love your cupcake, how fun! And fantastic weaving, so cool! Oh my, how cute is that! Love that cupcake topper and the grass wrap! I love the flower! Spellbinders has so many dies I never heard of and my list is growing. What an amazing project! I love the cupcake with all it's decoration! Those flowers are super great, I just love them, thank you for sharing. Wow! Such amazing work! Love it. Kazan! Those projects are stunning! Wow, wow, wow, how fabulous Kazan. You are so creative! Wowza, LOVE your beautiful projects today! This is all fabulous!! So fun! Your bag is amazing, I just ordered the anemone topper and can't wait to play with it. What beautiful bag. I love the weaving. What awesome projects! Love the coloring and that weaving is great! Thanks for sharing. WOUW I love both the bag and the flower. And I just love the bright colors you´ve used on both projects. Awesome wowrk hun. Very cute inspiration.... and I have to say i really enjoy your house posted yesterday! Great work. That is some awesome cupcake toppers. Beautiful Set!! Love the weaving!! Beautiful! Love those flowers and the really cool weaving! I love your project. The flowers are nice. I LOVE your woven paper project for the front of the gift bag!!! That must have taken you a very long time to complete! The cupcake topper and flower on the gift bag are adorable! WOW! What a creative & fun idea! Adorable also! You're a good Mom! beautiful gift bag and decoration, love the colors and details, and dimension. Thank you so much for the inspiration. Amazing creations!!! love them!!! Thank you for sharing! I adore your work, just lovely. 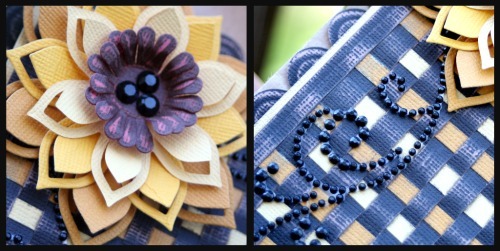 I love the texture of the weaving and your adorable cupcake toppers, so clever! Wow that weaving is totally awesome. Great inspiration! Great gift bag and cupcake flower!! Love the weaving and coloring of your weaving and the flowers them selves are great, just got that die yesterday and now can't wait to make those flowers!! Thanks for sharing your creations. Beautiful bag and love the cupcake. Love the weaving on the bag and the cupcake topper is great! love the flowers you created! The woven panel is jsut waaay cool, and those toppers are so cute! Love that die! The weaving is sooo cool. Bet those were a hit with your girls and their classmates! I always enjoy your work. This time no exception. Love the weaving. I don't know if I love the flower or the weaving better! Wonderful. WOW!!! The topper is terrific. I am afraid that I would not be able to eat that cupcake with all the gorgeous paper surrounding it!! Inspiring, love the lattice bag! That flower is gorgeous...I had no idea! and the weaving..just perfect. Great stuff! Thanks so much! Beautiful creations! I love those flowers! Gorgeous flower and love the weaving on your gift bag. What an awesome idea for cupcake toppers! WOW! Your work is simply stunning! 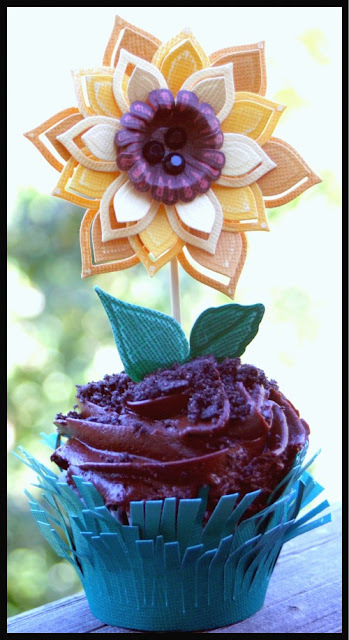 I absolutely love the woven effect of your gift bag, and the flower cupcake topper is perfectly charming! Thanks for showing off what the Core'dinations cardstock + Spellbinders dies can do! Love the weaving and the flower cupcake topper. Great projects Kazan. Love what you did on the bag especially. Your work is inspiring me! Thanks! Wow!! Both projects are gorgeous but I do really love the paper bag. The flowers are fantastic. Thanks for the opportunity to win!! Wow!! Just love the flowers you made, gorgeous. Thanks for the opportunity to win. What a great set!!! 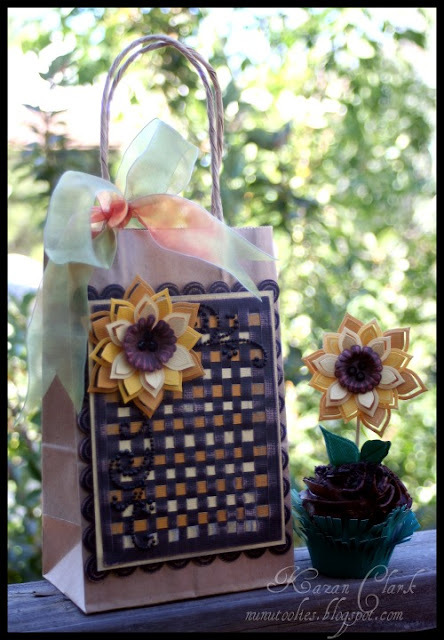 Love the woven panel on the bag and the cupcake topper is so inspirational. THanks for sharing! Wow! That anemone flower topper is great and I love the way that you used it on the decorative gift bag! The bag and cupcake topper are such a fun set, just beautifully done. Kazan your projects are so percise and beautiful.. Very beautiful thanks for sharing..
Adorable cupcake topper!!! And did you do the weaving? It looks perfect with the sunflowers. I love the flower/cake topper and the weaved background. Great job! really beautiful! makes that cupcake oh so special!! Love this gingham look and the flower.